Engine Timing Belt Kit with Water Pump-w/Water Pump AISIN TKT-021. AAIA Part Type Description : Engine Timing Belt Kit with Water Pump. Country of Origin (Primary) : JP. Interchange Part Number : TCKWP298, GTKWP298, AWK1231, 95298K1, CPK1231. Life Cycle Status Code : 2. Life Cycle Status Description : Available to Order. Other Part Number : WPK-0014, TB298LK1, TBW1006, TBK298P, TKT021. 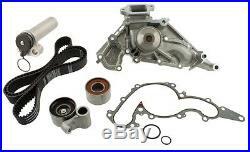 Product Description - Invoice - 40 : OE Timing Belt Kit with Water Pump. Product Description - Long - 80 : OE Timing Belt Kit with Water Pump. Product Description - Short - 20 : OE Timing Belt Kit. See Item Specifics section for additional specifications about this part. To confirm that this part fits your vehicle, enter your vehicle's Year, Make, Model, Trim and Engine in the Compatibility Table. Also review the notes section in the compatibility chart for additional specifications about this part. The engine types may include 4.0L 3969CC V8 GAS DOHC Naturally Aspirated, 4.3L 4293CC V8 GAS DOHC Naturally Aspirated, 4.7L 4663CC 285Cu. V8 GAS DOHC Naturally Aspirated. This part fits vehicles made in the following years 1998, 1999, 2000, 2001, 2002, 2003, 2004, 2005, 2006, 2007, 2008, 2009. This item may interchange to the following part numbers from other brands. Brands: ACDELCO, AIRTEX AUTOMOTIVE DIVISION, ASC INDUSTRIES, AUTOZONE/AIRTEX, AUTOZONE/CRP, AUTOZONE/DAYCO, CARQUEST/GATES, CONTINENTAL ELITE, CRP, CRP CANADA, DAYCO PRODUCTS LLC, GATES, GATES CANADA, IMPORT DIRECT WATER PUMP, IMPORT DIRECT WATER PUMPS/TIMING KITS, MASTER PRO SELECT WATER PUMP, MURRAY TEMPERATURE CONTROL, NAPA, NITOMA, PARTS PLUS, SKF (CHICAGO RAWHIDE), UNI-SELECT CAN/PRO SERIES WATER PUMPS Part Numbers: 95298K1, AWK1231, CPK1231, GTKWP298, PWPK-0014, TB298LK1, TBK298P, TBW1006, TCKWP298, TKT021, WPK-0014. Established in 1954, Automotive Supply has been at the nexus of Wichita's automotive aftermarket for more than 58 years. In one location since 1975 our 60,000 square foot facility has what you need. We serve the professional installer as well as walk-in individuals in Wichita and surrounding areas. Portions of the part information on this page have been provided by WHI Solutions, Inc. The item "Engine Timing Belt Kit with Water Pump-withWater Pump AISIN TKT-021" is in sale since Thursday, July 02, 2015. This item is in the category "eBay Motors\Parts & Accessories\Car & Truck Parts\Engines & Components\Timing Components". The seller is "automotivesupplyinc" and is located in Wichita, Kansas. This item can be shipped to United States, to Canada, to United Kingdom, DK, RO, SK, BG, CZ, FI, HU, LV, LT, MT, EE, to Australia, GR, PT, CY, SI, to Japan, to China, SE, KR, to Taiwan, ZA, TH, to Belgium, to France, to Hong Kong, to Ireland, to Netherlands, PL, to Spain, to Italy, to Germany, to Austria, RU, IL, to Mexico, to New Zealand, PH, SG, to Switzerland, NO, SA, UA, AE, QA, KW, BH, HR, MY, TR, BR, CL, CO, CR, DO, PA, TT, GT, SV, HN, JM.